STUDIO CITY, CA – November 7, 2018 – Merritt Patterson (“The Royals,” “The Christmas Cottage”) and Andrew Cooper (“Royal Hearts,” “Damnation,” “The Way”) star, along with Brittany Bristow (“Love on Safari”), in “Christmas at the Palace,” a new, original movie premiering Thanksgiving Day, Thursday, November 22, (8 p.m. ET/PT) on Hallmark Channel as part of the network’s #1-rated programming event, COUNTDOWN TO CHRISTMAS. Hallmark Channel is historically the #1 television network in all of Q4. Alexander summons Katie and Jessica for help and he’s just as surprised to discover who Katie is, as she is to learn he’s the King. 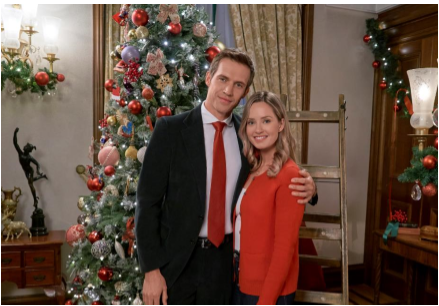 While creating the pageant and infusing Christmas joy into the palace, Katie and Alexander fall for one another and Christina grows close to Katie, who encourages the shy princess to overcome her fear and skate in the pageant. But when Jessica is injured, Katie might have to heed her own advice and stop hiding behind her choreographer’s role. At stake, too, is both her heart and Alexander’s, neither of which has been open for far too long. “Christmas at the Palace” is A Brad Krevoy Television Production. Brad Krevoy, Amanda Phillips Atkins, and Eric Jarboe, Amy Krell, Jimmy Townsend and Linda L. Miller are executive producers and Vince Balzano serves as the associate producer. Peter Hewitt directs from a screenplay by Joie Botkin.